Both men and women can have chest fat but when in women it looks normal for men, it can cause public awkwardness. Fat in men’s chest can accumulate around the breast area to develop awkward looking men breasts. However, the condition is not same as gynecomastia, which is actually the presence of glandular breasts or breast tissues or a combination of both in male body. Chest fat accumulation is sometimes called pseudo gynecomastia but there is no such condition described in medical terms. Chest fat can gather as a normal process as it gathers in other parts of body. This is often a typical condition for overweight and obese individuals. One way to get relief of chest fat is by working out or dieting. But these sometimes don’t work and then you need fat transfer surgeries to get rid of stubborn fat. There is treatment for both chest fat removal and gynecomastia, but first it needs proper diagnosis. Only experienced doctor will be able to tell you more about your condition. Chest fat appears normal and soft upon touching but gynecomastia may appear harder with or without presence of glandular tissue. For removing chest fat, liposuction is chosen as the best method. It is a process through which excess fat cells are removed from the body through small incisions. A powerful vacuum is attached to a hollow tube called cannula which is then inserted in patient’s body through incisions to remove fat cells. It gives permanent results than other methods. Liposuction is the most trusted method by doctors and patients alike in removing unwanted fat from body. Over the years the method has been really improved and most modern techniques are now used to reduce pain and side-effects. Assisted liposuction, such as laser or ultrasound, helps in liquefying the fat cells before draining it out of patient’s body, causing less pain and shortens the recovery period. Patients can go about their daily life almost immediately. Vaser liposuction is the third generation liposuction method that uses ultrasound waves and massage in melting fat cells in targeted area and if require transfers it to other parts of body. The result is faster recovery. Patients can also avoid the effects of general anaesthesia as it is performed under local sedation. The result of liposuction is most often permanent. If the patient keeps up a healthy lifestyle and a balanced diet, chances of accumulating fat gain in treated areas is zero. 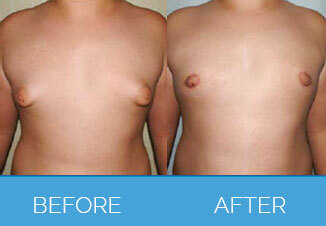 NuBodySculpting offers most advanced level chest fat removal surgeries to patients. It is one of the most trusted names in offering most advanced aesthetic treatments. Chest fat removal treatment in NuBodySculpting is also offered to women, which often results from weight gain. Before each procedure, the patient is treated with extensive consultation to help them learn the various aspects of the treatment. You can also be asked to perform mammogram as a regular screen process and also to determine feasibility of the treatment. All our centres are equipped with latest, state-of-art equipment.